For patients dealing with chipped, cracked, stained, gapped, or even crooked teeth, porcelain veneers are the solution they’ve been looking for. With just one simple procedure, Dr. Feit can give any patient the kind of beautiful smile that turns heads and lingers in people’s minds for hours afterward. If you’re ready to smile with complete confidence, Dr. Feit is ready to help you do it right here in Boca Raton. As with any dental procedure we provide, it will all start with a one-on-one conversation with Dr. Feit. You’ll have a chance to describe what you would like to change about your smile and what your ultimate goals are. 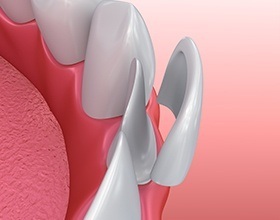 Using this information and a thorough yet quick exam of your mouth, Dr. Feit can determine if porcelain veneers are a good fit for you, your bite and your jaw relationship. If they are, the treatment will begin with him removing a tiny bit of enamel (less than the width of a contact lens) so the veneers will lay flat against your teeth and look more natural. He’ll then take an impression of your prepared teeth, and he’ll send it to a dental lab to actually fabricate your veneers. Before you leave this first appointment, you’ll be fitted with a temporary set so you can “test drive” your new smile. About a week or so later, you’ll return to our office to have your temporaries removed and your permanent veneers bonded to your teeth. After checking their fit and your bite one last time, your new smile will be ready for the world! With consistent brushing, flossing, and routine visits to Dr. Feit, you can look forward to your veneers lasting for decades or more. In just two appointments, Dr. Feit can completely transform your appearance and boost your confidence for decades to come. To learn more about porcelain veneers or schedule a consultation, contact us today.